It is quite notable when a school coordinates and implements an enriching outdoor learning experience for every student within each grade during the school year. It becomes exceptional when a school provides this opportunity to all students, year after year, for 18 consecutive years. But in fact, Newbury Elementary has done just that! 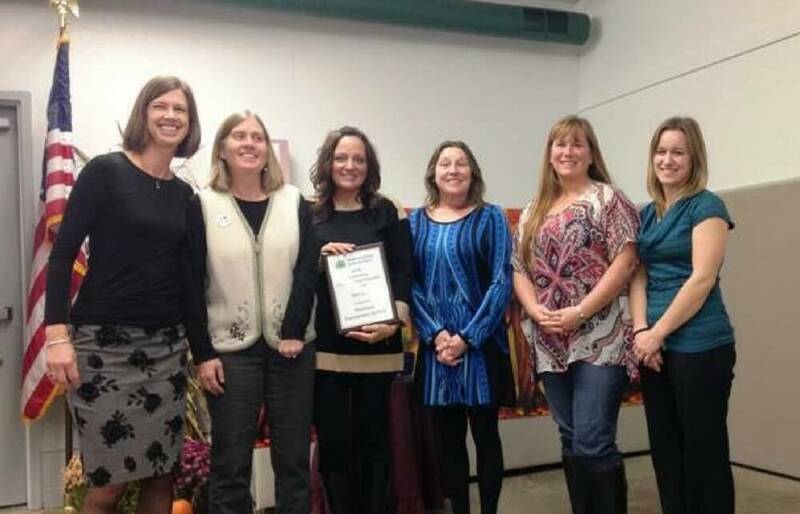 At their Annual Meeting on November 3rd, the Geauga Soil and Water Conservation District (SWCD) presented Newbury Elementary with the 2016 Outstanding Environmental Education Program Award for their unique, ongoing program which is now traditionally referred to as Wet Labs. Reflecting back to 1999, Newbury Elementary bravely attempted its first outdoor learning experience for all of their students to celebrate Earth Day under the leadership of Judy Barnhart, a dedicated parent and Geauga Park District naturalist. With the assistance of teachers and parent volunteers, students were taken outside to explore and learn in a newly-developed outdoor wetland area on the school grounds. Because of its success, the program continued and in 2001 Geauga SWCD also became a partner. Each year the theme, content, activities, and even the location would change, but consistently the core objective of the program remained: to provide students with hands-on, active learning and outdoor investigations to strengthen their comprehension of classroom lessons. For nearly two decades, the Newbury Elementary students have looked forward to this annual tradition that offers a break from the daily grind when they leave their books behind to spend a few prized hours in fresh air and sunshine, emerged in outdoor adventures! Topics have included wildlife detectives, trees, food chains, water quality and pollution, insects, soil, and weather, to name a few. The success of this environmental education program showcases the power of partnerships including the school teachers and administrators, parent and community volunteers, the Parent Teacher Organization (P.T.O), Geauga SWCD, and the Geauga Park District. Though both of her sons have long left Newbury Elementary and are now in college, Judy Barnhart will once again be part of the organizational helm this spring as we celebrate the program’s 19th year! Geauga SWCD thanks and honors all of those involved throughout the years to keep the Wet Labs program alive and well for the benefit of our students, and congratulates Newbury Elementary for earning the 2016 Outstanding Environmental Education Program Award. Pictured In Photo: Newbury Elementary representatives were recognized by Geauga SWCD for their “Wet Labs” program which received the Outstanding Environmental Education Program Award at the District’s Annual Meeting. Pictured left to right: Gail Prunty, Geauga SWCD; Judy Barnhart, Geauga Park District; Cyndi Tomassetti, Newbury Elementary Principal; Amy Morton and Donna Holden, parent volunteers; and Elissa Ebbert, Newbury Elementary teacher. Geauga SWCD: Still Standing! Celebrating Our BIGGEST Trees!